We’ve all been there. You are finally going on that snowboarding trip to Telluride. GoPro in tow with a full charge and memory to spare you are ready to capture all the gnar the weekend can throw at you. Only problem is afterwards you start to review your footage and it looks like an epileptic was your personal cameraman. 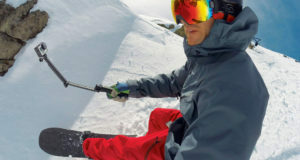 This is no good, but lucky for you we have compiled the best GoPro mounts for snowboarding.